Sorbus aucuparia, commonly called rowan and mountain-ash, is a species of deciduous tree or shrub in the rose family. It is a highly variable species, and botanists have used different definitions of the species to include or exclude trees native to certain areas; a recent definition includes trees native to most of Europe and parts of Asia, as well as northern Africa. The range extends from Madeira and Iceland to Russia and northern China. Unlike many plants with similar distributions, it is not native to Japan. S. aucuparia has a slender trunk with smooth bark, a loose and roundish crown, and its leaves are pinnate in pairs of leaflets on a central vein with a terminal leaflet. It blossoms from May to June in dense corymbs of small yellowish white flowers and develops small red pomes as fruit that ripen from August to October and are eaten by many bird species. The plant is undemanding and frost hardy and colonizes disrupted and inaccessible places as a short-lived pioneer species. Fruit and foliage of S. aucuparia have been used by humans in the creation of dishes and beverages, as a folk medicine, and as fodder for livestock. Its tough and flexible wood has traditionally been used for woodworking. It is planted to fortify soil in mountain regions or as an ornamental tree and has several cultivars. The binomial name Sorbus aucuparia is composed of the Latin words sorbus for service tree and aucuparia, which derives from the words avis for "bird" and capere for "catching" and describes the use of the fruit of S. aucuparia as bait for fowling. The plant is commonly known as rowan and mountain-ash, and has also been called Amur mountain-ash, European mountain-ash, quick beam, quickbeam, or rowan-berry. The names rowan and mountain ash may be applied to other species in Sorbus subgenus Sorbus, and mountain ash may be used for several other distantly related trees. The species is unrelated to the true ash trees (genus Fraxinus), which also carry pinnate leaves or the species Eucalyptus regnans, also called mountain ash, native to Tasmania and Victoria in southeastern Australia. S. aucuparia was previously categorized as Pyrus aucuparia. The author citation Sorbus aucuparia L. belongs to Carl Linnaeus. Sorbus aucuparia occurs as a tree or shrub that grows up to between 5 and 15 m in height. The crown is loose and roundish or irregularly shaped but wide and the plant often grows multiple trunks. A trunk is slender and cylindrical and reaches up to 40 cm in diameter, and the branches stick out and are slanted upwards. The bark of a young S. aucuparia is yellowish gray and gleaming and becomes gray-black with lengthwise cracks in advanced age; it descales in small flakes. Lenticels in the bark are elongated and colored a bright ocher. The plant does not often grow older than 80 years and is one of the shortest-lived trees in temperate climate. Wood of S. aucuparia has a wide reddish white sapwood and a light brown to reddish brown heartwood. It is diffuse-porous, flexible, elastic, and tough, but not durable, with a density of 600 to 7002700000000000000♠700 kg/m3 in a dried state. The roots of S. aucuparia grow wide and deep, and the plant is capable of root sprouting and can regenerate after coppicing. The compound leaves are pinnate with 4 to 9 pairs of leaflets on either side of a terete central vein and with a terminal leaflet. There are paired leaf-like stipules at the base of the petiole. The leaves are up to 20 cm long, 8 to 12 cm wide, and arranged in an alternate leaf pattern on a branch., distinguishing them from those of ash, Fraxinus excelsior, which are opposite and without stipules. The leaflets are elongated-lanceolate in shape, 2 to 6 cm long, and 1 to 2.5 cm wide with a sharply serrated edge, and have short stems or sit close to the central vein except for the outermost leaflet. Leaflets are covered in gray-silvery hairs after sprouting but become mostly bare after they unfold. Their upper side is dark green and their underside is a grayish green and felted. Young leaflets smell like marzipan when brayed. The leaflets are asymmetrical at the bottom. S. aucuparia foliage grows in May and turns yellow in autumn or a dark red in dry locations. Buds of S. aucuparia are often longer than 1 cm and have flossy to felted hairs. These hairs, which disappear over time, cover dark brown to black bud scales. The terminal buds are oval and pointed and larger than axillary buds, which are narrow, oval and pointed, close to the twig, and often curved towards it. S. aucuparia is monoecious. It reaches maturity at age 10 and carries ample fruit almost every year. The plant flowers from May to June (on occasion again in September) in many yellowish white corymbs that contain about 250 flowers. The corymbs are large, upright, and bulging. The flowers are between 8 and 10 mm in diameter and have five small, yellowish green, and triangular sepals that are covered in hairs or bare. The five round or oval petals are yellowish white and the flower has up to 25 stamens fused with the corolla to form a hypanthium and an ovary with two to five styles; the style is fused with the receptacle. Flowers of S. aucuparia have an unpleasant trimethylamine smell. Their nectar is high in fructose and glucose. Its fruit are round pomes between 8 and 10 mm in diameter that ripen from August to October. The fruit are green before they ripen and then typically turn to orange or scarlet in color. The sepals persist as a black, five-pointed star on the ripe fruit. A corymb carries 80 to 100 pomes. A pome contains a star-shaped ovary with two to five locules each containing one or two flat, narrow, and pointed reddish seeds. The flesh of the fruit contains carotenoids, citric acid, malic acid, parasorbic acid, pectin, provitamin A, sorbitol, tannin, and vitamin C. The seeds contain glycoside. Sorbus aucuparia has a chromosome number of 2n=34. It can be found in almost all of Europe and the Caucasus up to Northern Russia and Siberia, but it is not native to Southern Spain, Southern Greece, Sardinia, the Balearic Islands, the Azores, and the Faroe Islands. The species was introduced as an ornamental species in North America. It is widespread from plains to mountains up to the tree line where it grows as the only deciduous tree species among krummholz. In the Alps it grows at elevations of up to 2000 m. S. aucuparia appears north of the boreal forest at the arctic tree line; in Norway, it is found up to the 71st parallel north. It has naturalized in America from Washington to Alaska and eastward in Canada and the northeast of the US very successfully. Sorbus aucuparia is an undemanding species and can withstand shade. It is frost hardy and can tolerate winter dryness and a brief growing season. The plant is also resistant to air pollution, wind, and snow pressure. S. aucuparia mostly grows on soil that is moderately dry to moderately damp, acidic, low on nutrients, sandy, and loose. It often grows in stony soil or clay soil, but also sandy soil or wet peat. The plant grows best on fresh, loose, and fertile soil, prefers average humidity, and does not tolerate saline soil or waterlogging. It can be found in light woodland of all kinds and as a pioneer species over fallen dead trees or in clearcuttings, and at the edge of forests or at the sides of roads. Seeds of S. aucuparia germinate easily, so the plant may appear on inaccessible rock, ruins, branch forks, or on hollow trees. The tallest S. aucuparia in the United Kingdom stands in the Chiltern Hills in South East England. This exceptional specimen is 28 m tall and has a trunk diameter of 56 cm. In Germany, an unusually large specimen is located near Wendisch Waren, a village in Mecklenburg-Vorpommern. This tree stands at more than 15 m tall, is around 100 years old, and has a diameter of 70 cm. The tallest known S. aucuparia in Ireland is an 18 m tall specimen at Glenstal Abbey, County Limerick. Sorbus aucuparia is pollinated by bees and flies. Its seeds are not digested by birds and are thus propagated by being passed intact in their droppings. The fruit are eaten by about 60 bird species and several mammals. They are liked particularly by thrushes and other songbirds, and are also eaten by cloven-hoofed game, red fox, European badger, dormouse, and squirrel. Fruit of S. aucuparia are used as a food source by migratory birds in winter, including Bohemian waxwing, spotted nutcracker, and redwing. Cloven-hoofed game also excessively browse foliage and bark. The plant roots can be found in symbiosis with arbuscular mycorrhizal and less commonly with ectomycorrhizal fungi. It is usually later superseded by larger forest trees. In Central Europe it often grows in association with red elderberry, goat willow, Eurasian aspen, and silver birch. The plant is highly flammable and tends not to accumulate plant litter. Other species of the genus Sorbus easily hybridize with S. aucuparia and hybrid speciation can result; hybrids include Sorbus × hybrida, a small tree with oval serrated leaves and 2 to 3 pairs of leaflets, which is a hybrid with Sorbus × intermedia, and Sorbus thuringiaca, a medium-size tree with elongated leaves and 1 to 3 pairs of leaflets that are sometimes fused at the central vein, which is a hybrid with Sorbus aria. The main pests for S. aucuparia are the apple fruit moth Argyresthia conjugella and the mountain-ash sawfly Hoplocampa alpina. The rust fungus Gymnosporangium cornutum produces leaf galls. The leaves are not palatable to insects, but are used by insect larvae, including by the moth Venusia cambrica, the case-bearer moth Coleophora anatipennella, and leaf miners of the genus Stigmella. The snail Helix aspersa feeds on the leaves. The plant can suffer from fire blight. Fossils of Sorbus aucuparia have been described from the fossil flora of Kızılcahamam district in Turkey, which is of early Pliocene age. The fruit of S. aucuparia were used in the past to lure and catch birds. To humans, the fruit are bitter, astringent, laxative, diuretic and a cholagogue. They have vitamin C, so they prevent scurvy, but the parasorbic acid irritates the gastric mucosa. Pharmacist Mannfried Pahlow wrote that he doubted the toxicity of the fruit but advised against consuming large amounts. The fruit contain sorbitol, which can be used as a sugar substitute by diabetics, but its production is no longer relevant. Sorbus aucuparia fruits have been used in the traditional Austrian medicine internally (as tea, syrup, jelly or liqueur) for treatment of disorders of the respiratory tract, fever, infections, colds, flu, rheumatism and gout. Fresh fruit are usually unpalatable, but they can be debittered and made into compote, jelly, jam, a tangy syrup, a tart chutney, or juice, as well as wine and liqueur, or used for tea or to make flour. Fruit are served as a side dish to lamb or game. Debittering can be accomplished by freezing, cooking, or drying, which degrades the parasorbic acid. The fruit are red colored in August but usually only harvested in October after the first frost by cutting the corymbs. The robust qualities of S. aucuparia make it a source for fruit in harsh mountain climate and Maria Theresa, ruler of the Habsburg Monarchy, recommended the planting of the species in 1779. A more palatable variety, named Sorbus aucuparia var. dulcis Kraetzl, or var. edulis Dieck, or var. moravica Dippel, was first discovered in 1810 near Ostružná in the Hrubý Jeseník mountain range of Northern Moravia and became widespread in Germany and Austria the early 20th century. Its leaves are larger and pointed, only the front part of the leaflets is serrated, and they have darker bark, larger buds and larger fruit. Similar non-bitter varieties found in Southern Russia were first introduced in Central Europe in 1900 as 'Rossica' and 'Rossica Major', which has large fruit up to 1.5 cm in diameter. Two widespread cultivars of the Moravian variety are 'Konzentra' and 'Rosina', which were selected beginning in 1946 by the Institut für Gartenbau Dresden-Pillnitz, an agricultural research institute in Saxony, from 75 specimen found mostly in the Ore Mountains, and made available in 1954. Fruit of the more widely used 'Konzentra' are small to medium-sized, mildly aromatic and tart, easier to transport because of their thicker peel, and used for juicing, while fruit of 'Rosina' are larger, sweet and tart, and aromatic, and candied or used in compote. The two cultivars are self-pollinating, yield fruit early, and the sugar content increases while the acid content decreases as the fruit ripen. 'Beissneri' is a cultivar with reddish foliage and bark and serrated leaves. Other edible varieties originate in and are named after Klosterneuburg, Lower Austria. Russian botanist Ivan Vladimirovich Michurin began in 1905 to crossbreed common S. aucuparia with other species to create fruit trees. His experiments resulted in the cultivars 'Burka', 'Likjornaja', 'Dessertnaja', 'Granatnaja', 'Rubinovaja', and 'Titan'. Other S. aucuparia hybrids planted in Western Europe beginning in the 1980s include 'Apricot Queen', 'Brilliant Yellow', 'Chamois Glow', 'Pink Queen', and 'Salmon Queen'. The leaves were fermented with leaves of sweet gale and oak bark to create herb beer. Fruit are eaten as a mash in small amounts against lack of appetite or an upset stomach and stimulate production of gastric acid. In folk medicine they are used as a laxative, against rheumatism and kidney disease, and as a gargled juice against hoarseness. Wood of S. aucuparia is used for cartwright's work, turner's work, and woodcarving. Wood can be used from trees as young as 20 years. The sapwood is golden and white, while the heart-wood is brown. In almost treeless regions it is used as firewood. The leaves are sometimes used as fodder for livestock while the fruit are used against erysipeloid infections in domestic pigs and goats. Bark of the plant was used to dye wool brown or red. Honey from S. aucuparia flowers is strongly aromatic and has a reddish color. Sorbus aucuparia is planted in mountain ranges to fortify landslides and avalanche zones. It is also used as an ornamental plant in parks, gardens, or as an avenue tree. Ornamental cultivars include 'Asplenifolia', which has divided and sharply serrated leaflets, 'Blackhawk', which has large fruit and dark green foliage, 'Fastigiata', which has an upright columnar form, 'Fructu Luteo', which has orange yellow fruit, 'Michred', which has brilliant red fruit, 'Pendula', which is a weeping tree, and 'Xanthocarpa', which has orange yellow fruit. ‘Sheerwater Seedling', an upright and slender cultivar, has gained the Royal Horticultural Society’s Award of Garden Merit. Cultivars are vegetatively propagated via cuttings, grafting, or shield budding. In the Prose Edda, the Norse god Thor saves himself from a rapid river created by the giantess Gjálp by grabbing hold of a rowan, which became known as "Thor's protection". In English folklore, twigs of S. aucuparia were believed to ward off evil spirits and witches. The plant was called "the witch" in England and dowsing rods to find ores were made out of its wood. Twigs of S. aucuparia were used to drive cattle to the pasture for the first time in spring to ensure their health and fertility. The wooden shafts of forks and other farm implements were constructed from S. aucuparia, to protect farm animals and production from witches' spells. 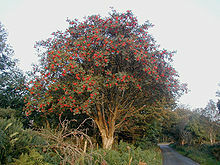 In weather lore, a year with plentiful rowan fruit would have a good grain harvest but be followed by a severe winter. S. aucuparia is used in the coats of arms of the German municipalities Ebernhahn, Eschenrode, and Hermsdorf, and of the Vysočina Region of the Czech Republic. Rowan is part of the coat of arms of the Metropolitan Borough of Wigan and the logo of both Wigan Athletic and Wigan Warriors. ^ a b McAllister, H.A. (2005). The genus Sorbus: Mountain Ash and other Rowans. Kew Publishing. ISBN 9781842460887. ^ "Sorbus aucuparia". Germplasm Resources Information Network (GRIN). Agricultural Research Service (ARS), United States Department of Agriculture (USDA). Retrieved 7 April 2013. ^ Rich, T. C. G. "The Plant Crib, Sorbus" (PDF). Botanical Society of Britain and Ireland. ^ "Record Rowan". Chilterns Conservation Board. Archived from the original on 7 April 2013. Retrieved 7 April 2013. ^ "Rowan (Sorbus aucuparia L.)" (PDF). Department of Agriculture, Food and the Marine. 2001. ^ a b Alan Watson Featherstone (8 November 2010). "Trees for Life - Rowan Species Profile". Trees for Life. Archived from the original on 26 April 2013. Retrieved 26 April 2013. ^ Vogl S, Picker P, Mihaly-Bison J, Fakhrudin N, Atanasov AG, Heiss EH, Wawrosch C, Reznicek G, Dirsch VM, Saukel J, Kopp B (Oct 2013). "Ethnopharmacological in vitro studies on Austria's folk medicine - An unexplored lore in vitro anti-inflammatory activities of 71 Austrian traditional herbal drugs". Journal of Ethnopharmacology. 149 (3): 750–71. doi:10.1016/j.jep.2013.06.007. PMC 3791396. PMID 23770053. ^ "RHS Plantfinder - Sorbus aucuparia 'Sheerwater Seedling'". Retrieved 15 November 2018. ^ "AGM Plants - Ornamental" (PDF). Royal Horticultural Society. July 2017. p. 98. Retrieved 15 November 2018. ^ a b Simpson, J.; Roud, S. (2000). Dictionary of English folklore. Oxford University Press, Incorporated. ISBN 9780192100191. ^ "Witchcraft: The Mountain Ash", in The Table Book, ed. William Hone, (London: 1827) p. 337. ^ "The Mountain Ash, or Wicken or Wiggen Tree", in Lancashire Folk-lore: Illustrative of the Superstitious Beliefs and Practices, Local Customs and Usages of the People of the County Palatine, edited by John Harland and T. T. Wilkinson, (London: 1867) p 72-74. Enzyklopädie der Garten- und Zimmerpflanzen (in German). Munich: Orbis. 1994. ISBN 3-572-00685-6. Aichele, Dietmar; Golte-Bechtle, Marianne (1997). Das neue Was blüht denn da? (in German) (56th ed.). Stuttgart: Kosmos. ISBN 3-440-07244-4. Hora, Bayard, ed. (1993). Bäume der Welt (in German). Translated by Wolfgang Steuer (2nd ed.). Stuttgart: DRW-Verlag. ISBN 3-87181-205-6. Breckwoldt, Michael (2011). Essen aus der Natur (in German). Berlin: Stiftung Warentest. ISBN 978-3-86851-021-8. Dreyer, Eva-Maria (2009). Welche Wildkräuter und Beeren sind das? (in German). Stuttgart: Kosmos. ISBN 978-3-440-11808-5. Erlbeck, Reinhold; Haseder, Ilse E.; Stinglwagner, Gerhard K. F. (1998). Das Kosmos Wald- und Forstlexikon (in German). Stuttgart: Kosmos. ISBN 3-440-07511-7. Fischer, Manfred (1995). Farbatlas Obstsorten (in German). Stuttgart: Ulmer. ISBN 3-8001-5542-7. Flint, Harrison L. (1997). Landscape Plants for Eastern North America. Wiley. ISBN 0-471-59919-0. Friedrich, Gerhard; Schuricht, Werner (1989). Seltenes Kern-, Stein- und Beerenobst (in German) (1st ed.). Melsungen: Neumann-Neudamm. ISBN 3-7888-0562-5. Garcke, August (1972). von Weihe, Konrad (ed.). Illustrierte Flora (in German) (23rd ed.). Berlin, Hamburg: Parey. ISBN 3-489-68034-0. Godet, Jean-Denis (1994). Bäume und Sträucher (in German). Augsburg: Naturbuch-Verlag. ISBN 3-89440-154-0. Godet, Jean-Denis (1998). Einheimische Bäume und Sträucher (in German). Augsburg: Naturbuch-Verlag. ISBN 3-89440-296-2. Godet, Jean-Denis (2008). Knospen und Zweige (in German). Stuttgart: Ulmer. ISBN 978-3-8001-5778-5. Harz, Kurt (2009). Bäume und Sträucher (in German) (14th ed.). Munich: BLV. ISBN 978-3-8354-0479-3. Hecker, Ulrich (1995). Bäume und Sträucher. Früchte, Knospen, Rinden (in German) (3rd ed.). Munich: BLV. ISBN 3-405-13737-3. Henschel, Detlev (2002). Essbare Wildbeeren und Wildpflanzen (in German) (1st ed.). Stuttgart: Kosmos. ISBN 3-440-09154-6. Hensel, Wolfgang (2007). Welche Heilpflanze ist das? (in German). Stuttgart: Kosmos. ISBN 978-3-440-10798-0. Kremer, Bruno P. (2010). Essbare & giftige Wildpflanzen (in German). Stuttgart: Ulmer. ISBN 978-3-8001-5344-2. Laudert, Doris (1999). Mythos Baum (in German) (2nd ed.). Munich: BLV. ISBN 3-405-15350-6. Lohmann, Michael (2005). Bäume & Sträucher (in German). Munich: BLV. ISBN 3-405-16875-9. McTurk, Rory (1997). "Marie de France, Geirmundar þáttr heljarskinns, and reader-response criticism". In Lecouteux, Claude (ed.). Hugur. Paris: Presses de l'Université de Paris-Sorbonne. ISBN 2-84050-089-2. Neuweiler, Reto; Röthlisberger, Kurt; Rusterholz, Peter; Terrettaz, Roland (2000). Beeren und besondere Obstarten (in German) (1st ed.). Zollikofen: LmZ. ISBN 3-906679-75-6. Pahlow, Mannfried (1993). Das große Buch der Heilpflanzen (in German) (Revised ed.). Munich: Gräfe und Unzer. ISBN 3-7742-1472-7. Paul, Anthony; Rees, Yvonne (1990). Bäume im Garten (in German). Translated by Erhard Held. Ravensburg: O. Maier. ISBN 3-473-46173-3. Raspé, Olivier; Findlay, Catherine; Jacquemart, Anne-Laure (2000). "Sorbus aucuparia L". Journal of Ecology. 88 (5): 910–930. doi:10.1046/j.1365-2745.2000.00502.x. Reichholf, Josef H.; Steinbach, Gunter, eds. (1992). Naturenzyklopädie Europas (in German). 7. Munich: Mosaik. ISBN 3-576-10107-1. Schauer, Thomas (2001). Der große BLV-Pflanzenführer (in German) (8th ed.). Munich: BLV. ISBN 3-405-16014-6. Scherf, Gertrud (2006). Wildpflanzen neu entdecken (in German) (1st ed.). Munich: BLV. ISBN 978-3-8354-0062-7. Smolik, H. W. (1996). Naturführer Deutschland (in German). Cologne: Tigris. ISBN 3-632-98919-2. Ullrich, Bernd; Kühn, Uwe; Kühn, Stefan (2009). Unsere 500 ältesten Bäume (in German). Munich: BLV. ISBN 978-3-8354-0376-5. Větvička, Václav (1995). Dausien's grosses Buch der Bäume und Sträucher (in German). Translated by Jürgen Ostmeyer (3rd ed.). Hanau: Dausien. ISBN 3-7684-2509-6. Zauner, Georg (2000). GU-Kompass Laubbäume (in German) (10th ed.). Munich: Gräfe und Unzer. ISBN 3-7742-6205-5.